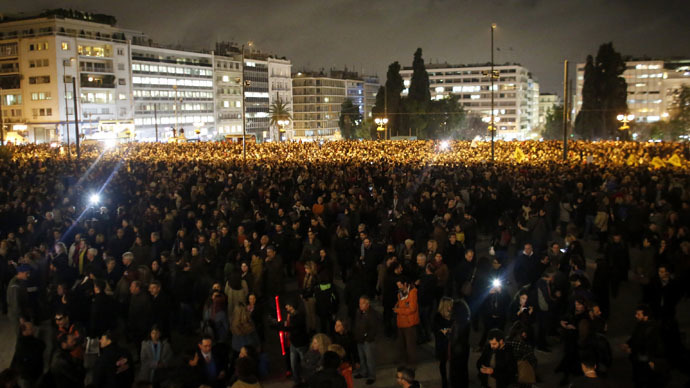 Thousands have attended a pro-government rally in Athens to demonstrate their opposition to anti-austerity measures. The meeting passed off peacefully, and the public gave a collective thumbs-up to the newly elected Greek government. Police estimated the gathering on Syntagma Square outside the country’s parliament at around 5,000. No unrest was reported, which was in stark contrast to 2012, when violent protests erupted at the height of the Greek economic crisis. The majority of Greeks were angry at the previous government, led by Antonis Samaras, which agreed to the terms of a €240-billion EU bailout. The Troika group of inspectors were responsible for making sure Greece stuck to its pledge to tighten its financial belt, which led to severe cuts in public services and tax hikes. This helped push one-third of the country into poverty. The scene could not have been more different. There wasn’t a police officer in sight, while protesters were able to reach the parliament steps, after one of the first actions of the new government had been to pull down an iron fence restricting public access. "It's the first demonstration in favor of a Greek government. Finally, we have a government which respects its campaign promises and defends the interests of our country," Telemaque Papatheodorou, an engineer in his 30s, told AFP. The demonstrators, who attended the spontaneously arranged rally, organized by social media, chanted the name of Greece’s new Finance Minister Yanis Varoufakis. The politician has become something of a cult hero at home, due to his endeavors to try and renegotiate the country’s debt and end austerity. "We can no longer afford austerity,” said a woman, who was attending the demonstration. “We can’t respond to the programs outlined by Germany. We want to do as much as humanly possible – at least to sit down and talk about the issues in Greece,” she added, according to Reuters. One banner being held aloft in the crowd read, “Merkel sees you and snaps like a twig. Well played Yanis Varoufakis.” This was in reference to the German chancellor who has been a major player in the austerity measures imposed on Athens, following the country’s bailout in 2010, which has proved deeply unpopular with a vast number of Greeks. The hastily arranged meeting was called after a decision by the European Central Bank to cut off a vital source of funding for banks in Greece. Previously they had been able to use government debt as collateral for loans. However, this ‘lifeline’ has now been cut, leaving banks in Greece without a key source of securing capital. The rally also took place on the back of a meeting between Varoufakis and the German Finance Minister Wolfgang Schaeuble. Varoufakis, some 19 years younger than his 72-year-old German counterpart said Germany should understand Greece’s current predicament as Berlin’s own depression in the early 20th century gave a platform for the rise of the Nazi party. "Nazism is rearing its ugly head in Greece," said Varoufakis, apparently referring to the far-right Greek political party Golden Dawn, who came third in the recent parliamentary elections, Reuters reported. Speaking just days after their election victory, Syriza MEP Professor George Katrouglas told RT that Greece deserves the same help that Greece and Spain gave Germany over 60 years ago, with almost half of Germany’s war debts being annulled. “Debt is not just a Greek problem. It is not even just a problem of the south, the countries of the EU periphery. It is a European problem. If we have an EU divided and countries that cannot pay their debt, and countries like Germany are gaining from that, we have a union that can no longer keep its cohesion,” Katrougalos said.